More power to you with a Saber Power generator. This portable Inverter generator provides a clean and reliable power source for various trade and recreational applications. It's light compact and quite, perfect for powering building and camping sites, TV's, laptops, household appliances and power tools. Fitted with IP44 rated sockets, ECO mode, DC outlet and USB outlets this generator ensures you will have power wherever you need it. All Saber Generators have pure sine wave technology and are suitable for powering sensitive electronic equipment. We back our product with a national 2 year warranty. Saber Generators are lab and third party tested, we stand by our quality and power ratings. 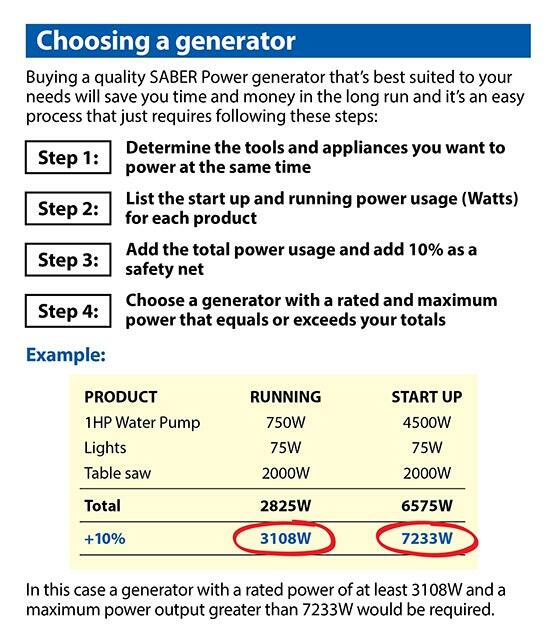 Need help choosing the right size generator or not sure which features you need? Check out our buying guide that will make the process simple. This product is prepped for Pre Delivery. All our petrol engines are certified and we warranty all products.